Lightweight and versatile, offering easy maneuverability in town or outdoors, the Baby Jogger City Mini Double is a popular double stroller option for twins of all ages. Both seats fully recline to accommodate infants, but the sturdy frame and padded seats remain comfortable for children up to 100 pounds combined weight. Lightweight, and not as bulky as some other double strollers. Customize with a belly bar, snack tray or glider platform for an older child. Reclining seats can be used for infants. 100-pound weight capacity makes it ideal for bigger twins, too. Wide profile may not fit through some narrow doorways. It's on the pricey side, retailing for $400+. Can not be used as a travel system with infant car seats; only accommodates one seat. A mid-range, multi-purpose double stroller. A side-by-side stroller with two front seats. Both seats fully recline so even infants can rest comfortably. Padded seats, accessories and a sturdy frame give this double stroller potential for a long lifetime of use. Baby Jogger's easy fold technology makes the City Mini Double one of the easiest double strollers to fold down for storage. Only accommodates a single infant car seat, so don't expect to use it as a travel system with twins. Lightweight with a slim profile that makes it easy to store. Glider board function offers a platform for an older sibling to ride along. Dimensions: 38.5" long -x- 29.75" wide -x- 41.5" high when assembled. 31" long -x- 29.75" wide -x- 11.25" high when folded. The Baby Jogger City Mini double stroller gets high accolades among other strollers in other double stroller reviews. So I decided to take a closer look at this product. 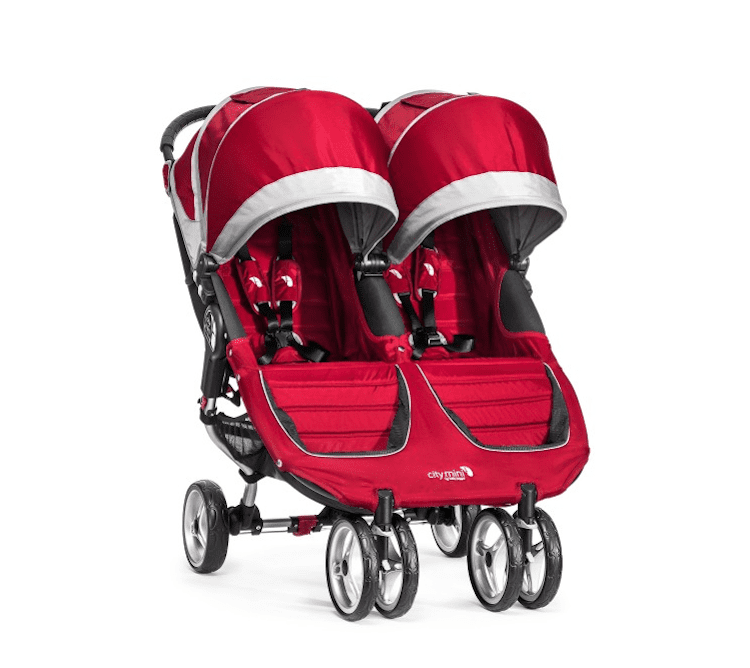 Could it really be the perfect double stroller for twins? The Baby Jogger City Mini double is a side-by-side style of double stroller, with two seats facing the same way, positioning both twins in an equal setting. This stroller style is often more compact and easier to store, but may be more difficult to maneuver through narrow doorways or hallways. Produced by the Baby Jogger company, it has many of the features associated with more rugged use in a compact stroller that is suited for strolling around town. Unlike traditional jogger-style strollers with their single front wheel design, the City Mini Double has four dual-swivel front wheels, making it maneuverable around town. The wheels can also be locked into place for a smooth ride over long distances. Although the Baby Jogger City Mini does not accommodate two infant seats, it can still be used with young twins. Both seats in the stroller recline nearly flat, so even newborns can be comfortable. The seats provide lots of padding and a five-point restraint. As your twins grow, customize your City Mini double with accessories like a safety bar or tray. Storage pockets line the back of the two seats and a basket underneath the stroller provides extra storage. Individual canopies have windows so you can peek at your twins, and both canopies are adjustable. One of the best features of the Baby Jogger City Mini double stroller is the easy fold down — the Baby Jogger website illustrates a one-handed operation ideal for parents of multiples who have their hands full! A sleek profile when folded makes it easy to store. And at 26.6 pounds, it is a lightweight double stroller option that won't break your back when you have to carry it.